River Daniels’ life has never been easy. Her mother died of cancer and her family was forced to move into a trailer park. Her stepfather is a drunk who hardly takes care of River and her sister. But River has always had a great group of friends who support her through everything, until she begins dating Logan, a spoiled rich kid who doesn’t treat River well at all. She sacrifices time with her friends for him, and even though he is horrible to her she keeps going back to him. Her friends keep trying to convince her to break up with him but River keeps defending him, until one night when he brutally attacks her, forcing her to take action. After she realizes what she’s done, River is forced to flee her home as a fugitive, with her two best girlfriends along for the ride. What I really loved about this book was River’s growth–she goes from being basically a battered woman, constantly going back to a boyfriend who mistreats her, to a strong woman, determined to prove her innocence and get her life back. It’s a long journey for her, but she survives and copes really well. I also loved River’s friends and their constant loyalty to her. Her best friend Justice, who is obviously in love with her, is willing to do anything to keep her safe even though she doesn’t realize it. Her two best girlfriends, Kat and Billi Jo, were slightly annoying characters but I admired their decision to sacrifice their own lives to help their best friend. River is put in an extremely difficult situation and they really help her to recover. There were some parts of this book that dragged a little bit, but not so much that I felt bored while reading it. River just annoyed me a few times, mainly because of her back and forth with Justice and her inability to believe their was any way he could love her, and also because of her constant jealously that Justice has a girlfriend. She gets upset when he didn’t approve of her relationship with psychopath Logan, but she is allowed to get super jealous of his perfectly normal girlfriend. 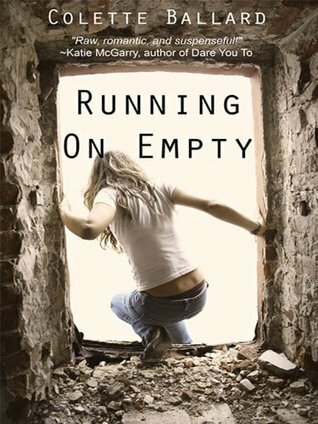 Overall, Running On Empty was a great story about a girl struggling to recover and get her life back after a traumatic event. While River did annoy me at times, I admired her ability to cope and grow as a person after such a difficult time. Running On Empty was released on November 25, 2013.